Today is National Blond Brownies Day. Blond Brownies is a misnomer. Blondies are not Brownies! They get their flavor from brown sugar and not cocoa or chocolate, but they're wonderful for exactly what they are--a great butterscotch 'brownie.' Over the years, I've added macadamia nuts, white chocolate chips, butterscotch chips, chocolate chips, or a combination of these ingredients to the following basic recipe. The variety of additions is huge, and the basic batter is a delicious brown sugar concoction. Blondies are simple to make, and I highly recommend them. I use dark brown sugar because I think it has more flavor. As in any recipe, the quality of the ingredients makes a difference in your final product. 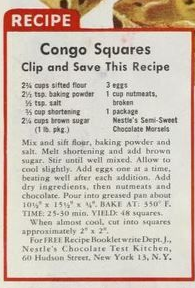 Love this Retro Ad & Recipe for Congo Squares aka Blondies or Blond Brownies. As always, you can never have too many recipes! Congo Squares or Bars, by the way, have nothing to do with Africa. There's nothing like these sweet in any African country that I know of...and you can't even grow wheat in Central Africa. So why are they called Congo Squares? Who knows.. maybe because of the exotic ingredients (chocolate, cocoanut, nuts) which might come from Africa? I also read somewhere that these Congo Squares originated in the Southeast (US). There was a plaza in New Orleans called Congo Square which in the early 19th century was a gathering place for both free and enslaved African-Americans who met for marketing, music-making and dancing... probably not the connection, but a possibility. Whatever the origin, this is a great treat for the weekend! This Nestle ad is from 1949 and doesn't include the cocoanut, but throw some toasted cocoanut in.